It's that time of year again when millions of shoppers find themselves frantically searching online or running around stores to pick up gifts for their loved ones - or themselves. If you or someone you know is wanting a Nintendo Switch this holiday, this bundle could be a perfect option. Available for the console's standard retail price of £279.99, this Nintendo Switch console deal comes with a copy of the ultra-popular (and ultra-amazing) Mario Kart 8 Deluxe, the moustachioed plumber's latest karting adventure. The game is included as a digital download code meaning you can simply hook your console up to the internet when it arrives, pop in the code, and you'll have a shiny copy of the game waiting for you. Lovely. The bundle has already appeared at some stores, and other retailers are expected to follow in due course. We'll make sure to add any others to this list as we find them. Of course, this bundle is the ideal option for those not wanting to spend too much on their new gaming machine - Mario Kart 8 Deluxe has a recommended retail price of £49.99, so that's some pretty serious saving. Is this the type of bundle you've been waiting for? Let us know if you'll be grabbing one in the comments below. Bundle means it's not free. I have no doubt Mario Kart 8 Deluxe will be the best selling Switch game when Nintendo next reports. This is a good deal ahead of Christmas. It would have been a great deal if they got this on shelves for Black Friday at £250 though! Bundle Pokemon Let's Go Pikachu was cool fans. @kopaka good thinking...I immediately thought "free" and there would be hopes of a US release....good catch. I'm grabbing a Switch asap....my son has one....I gotta get myself one. @NewAdvent Exactly, free copy of the game for the same price. I would prefer a physical copy of the game but this keeps the cost down for Nintendo. I think you can get this deal in the UK from very @£250 now, which is a pretty good deal and finally beats my cyber Monday deal from 2 years ago of 289 for Mario kart and Mario ware rabbits game thingy. This is also a sign that we might be getting the new upgraded console sooner rather than later! This bundle sold out everywhere in the US on Black Friday. It was available from the 4 biggest retailers. GameStop even threw in a $50 gift card. If only BotW was available with consoles in a bundle at launch. It felt a bit empty without a game considering it was just the system. Good to see they're changing it though! @kopaka Comprehensive reading is a key quality. @HobbitGamer yeah that's what "bundle" means. Still not "free". Like with the ps4 bundle with (not sure here) Horizon, GT sport and Uncharted 4, it's going for a standart price, but games are not free. They are free if you can buy another bundle and get them too. @kopaka They are free. It's not adding to the cost. It's an item you'd normally pay extra for when purchased separately, but this SKU has it bundled for no extra cost. "Switch plus Mario Kart 8 DX for the same price as a Switch." @HobbitGamer "free" means you don't have to pay. This bundle costs money, which means it's not free. @kopaka I think you are still not comprehending this. 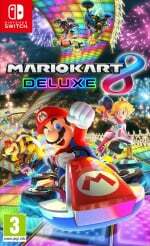 The Mario Kart 8 Deluxe game part of the bundle is free, while the actual Switch console is at its regular price. But the wording could be improved, as “a Mario Kart 8 Deluxe bundle at the price of a regular Switch console” is just a little clearer.